HPANWO: Say NO! to the NWO! “Bullhorning” is going to place which is a centre of authority and government, like the White House or Houses of Parliament, and lecturing or accusing loudly through a megaphone. It’s most famously used by Alex Jones; he travels all over the world bullhorning state governors, presidents and prime ministers. I never thought I’d do it myself; I didn’t think it was my style, but once I started I did a pretty good job and rather enjoyed it! It was a satisfying release of emotion! ("Bullhorn" is what Americans call a megaphone. As you can see from the vid, Izzy had to do a bit of subtitling for our American friends!) The other man speaking is Bryan, and the two of us were an effective double-act, a “good cop-bad cop” team! Several other speakers did a bit of bullhorning too and they were good as well. Eventually the megaphone broke down, through overuse and we had to resort to a spare one! 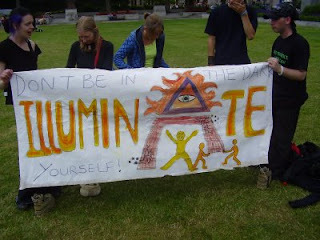 It all happened when I went along to the July the 4th Anti-New World Order protest yesterday. This was an international event; Americans assembled in Washington, and in Berlin the crowds gathered at the Brandenburger Tor. This was the first ever event of its kind. The multiple peace marchers, environmental marchers and anti-globalization marchers do a good job addressing different secondary effects of the New World Order agenda, but they fail to understand and protest against the cause of all those problems: The Illuminati agenda for the fascist one-world government. It was a wonderful day. We ruffled a few feathers and rattled a few cages! Many people stopped and watched us and we got a very good response from passing motorists. As you can see in this vid: http://uk.youtube.com/watch?v=zG26qiK4-RI some of the protesters even managed to give the policemen guarding the Palace of Westminster’s gate something to think about. Did we even convert them? 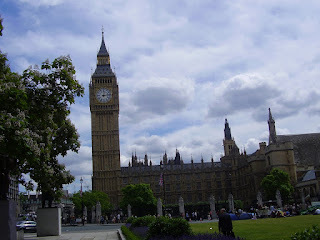 It was very hot in Parliament Square and I got a bit sunburned. My painful back and hip was hurting where I injured them in Glastonbury, and I used a pair of crutches to walk to the venue. But I wouldn’t have missed it for anything. Everyone who attended these events should feel very proud of themselves. I hope the Illuminati lost a few hours sleep last night! If I were them I would! This is the kind of thing we need to do more often. Hopefully it will be the first of many international acts of awareness into the emergence of the Big Brother State. 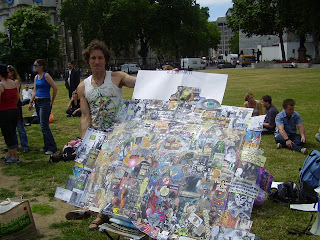 I met many people I’ve never seen before, including another member of the David Icke forum. Many of the protesters wore themed T-shirts, including myself. They also brought along banners and, as you can see in the pictures, that intricate montage by a man called Barry who also wore an incredible T-shirt of his own design. I hope I see these people again soon; I hope we get the chance to do another street-demo like this again soon. I wonder how the protest went in Washington and Berlin. Hopefully there’ll be some vids of them up soon too. I’ll post them in the comments box as they appear. Absolutely hilarious! Wish I'd come. Brilliant Ben - good on ya for standing up & being counted. ML, there's another protest at the same time same place on Tuesday September the 2nd. Watch this new announcement by Izzy. Nice one my friend! Down with the NWO! Keep fighting the good fight bro. Did you know that you can get these ON AUTOPILOT AND ABSOLUTELY FOR FREE by registering on You Like Hits?